In one weekend we hosted three different groups of people, went to a BBQ outside our house, built a deck, went through a Costco sized lot of sunscreen, exercised everyday and oh, also potty trained a 2 year old red head. Over Tuesday morning coffee the adults in the house decided that we were thankful the weekend was over so we could finally get some rest. Ha! The weekend actually started out pretty chill. Dan had to work late and the Champs were gone, so the girls and I just hung out. I had marinated some chicken before I left for work, so dinner making consisted of firing up the Traeger and opening a bag of arugula. Summer food, please don't ever leave me. After putting Mira to sleep I did get the chance to swim with the older girls for a few minutes and soaked in the time with them. Saturday morning Danielle and I went on a fast 3 mile run and then I worked for a few hours while Dan and Mr. Kyle started their big weekend project - a deck on the back of the pool. I feel like it is important to note that this deck is being built 100% from scrap wood that Dan has brought home from work over the years, which I have always been unhappy about until this weekend. The rest of the afternoon was spent swimming, potty training/negotiating, and making food for dinner. My sister's family came over for some pool action and we had so much fun swimming and playing and talking and laughing and drinking our new favorite drink of the summer (see recipes below). I love them and wish I could see them more often. Sunday morning Danielle and I went on our Sunday morning coffee walk (this might be my favorite part of the week) and then we all got ready for church. After an amazing church service (our youth pastor rapped -seriously) we came home and did the swim/cook/potty train/work on deck thing until it was time to visit Grandma Frankie's house for a BBQ. The girls always love going to her house, and this time was no exception. At one point I walked up to see my girls literally digging their fingers into an otherwise flawless and uncut ice cream cake and proceeded to yell and flail my arms and ask, "what made you think you could do that?" to which all the other adults sitting around said, "we told them they could." At another point an older gentleman told Dan and I we were the luckiest people in the world to have three healthy beautiful daughters and I was so thankful for that reminder. We returned home to Danielle's family visiting our house and joined them for a swim after I put the two youngest to bed after a very trying potty training day. My strategy has pretty much been to have Cora sit on the potty every thirty minutes for as long as it takes me to read her a book. Although she sometimes puts up a fight, she does eventually sit there, but rarely will go potty. I have offered her all sorts of rewards and she did earn quite a few of them this weekend. She has also had a few accidents, which is of course to be expected, but she mostly just holds it until she is in a pull up for nap or bed time, which isn't healthy or ideal. I am hoping this is just part of the process and if we keep on with our system, it will eventually work. Monday Danielle got up early to make cinnamon rolls and I mostly stood there watching for moral support. Then we walked down to the gym to complete Murph with some of my favorite people. I can't do a pull-up, so we did ring rows instead, and the majority of the push-ups were from my knees, and I am still sore today. Oof. We walked home to the Nybergs already at the house ready to swim and the cinnamon rolls hot out of the oven. I wish I could say that I enjoyed their visit, but I spent most of it trying to get Cora to go to the bathroom so she could get in the pool, but she was just hysterical. After a few hours of nothing but tears and frustration from everyone she took an early nap. Brad did help Dan and Mr. Kyle with the deck and Chessa did help by bringing over mimosas, lunch, and holding Mira while I was in the throws of potty training, so I was so thankful they were there. After they left I did get the chance to lay horizontal on a floatie in the pool for a few minutes while the two younger girls were asleep and Ina was swimming around me. Through the sheer power of teamwork the men were able to finish the floor phase of the deck, which of course called for many cannon balls. I did one and hit the bottom of the pool so hard I decided one was enough for me. The rest of the afternoon was filled with some more potty training frustrations and a few successes and a very early bath and bedtime. I have survived potty training once and I know I will again. Epic brownies - Danielle makes these, because when I do they turn out more like cake. A great chicken marinade served with arugula salad and grilled corn on the cob. Beergarita- a beer topped with a few splashes of flavored margarita mix. So delicious. Have a wonderful last week of May! Monday after work I made the rogue decision to swim with the kids and do water aerobics with Danielle in the 0.95 hour window I had between picking everyone up/getting snacks/nursing the baby and getting out of the pool/drying off/leaving for dance lessons. Swimming was fun, but during the mad rush after there was one point when all three girls were crying at the same time (Mira because I think she is cutting a tooth, Cora because she was wet, cold, and wanted me to hold her, and Ina because I was trying to comb through her jungle hair to get it into a somewhat presentable bun for dance). Lots of deep breathing later Mira, Ina, and I were off to dance lessons. Cora stayed with Danielle who also cooked us dinner while we were gone (there is a special place in heaven for that woman). Ina learned the dance to the opening number for her dance recital to the Gilligan's Island theme song. I loved watching every second and there is an adorable part during the lightning/thunder strike where the girls do a star jump and my 9 year old self wanted to join in. After leaving dance, then turning around half way home when I realized I forgot a recital ticket for one family member, we came home to a delicious spaghetti dinner. Tuesday morning my friend Hannah came over for coffee talk with Danielle and I, which is always such a great way to start the day. I worked from home, which usually makes the day more calm, but I had back to back meetings starting at 7 am. Granny picked the girls up around 8 and the day was non-stop until I closed my lap top at 4:15 to pick the girls up for swim lessons. I was just getting the hang of taking all three kids to swim lessons by myself when Cora made sure to knock my confidence down a few notches. The logistics of swim diapers that don't collect liquid are complicated, which resulted in Cora screaming, "I pottied, I pottied" and me dragging her and a napping Mira in her thousand pound carseat to the bathroom, rinsing everything out, and politely asking for Clorox wipes at the front desk. We came from from swim lessons to get in our pool, but I had to quickly exit because Cora filled her swim diaper again...which has never happened in the 2 years she has been swimming. Look forward to potty training updates v. soon. Wednesday I spent a large part of the day freaking out about the chemicals in our pool after Danielle took some water to the pool store and they printed out a report detailing the billion steps we needed to take to fix the billion problems there were. I knew something was wrong when Danielle text me that she had a report. They have never given us a "report" before. However, I stopped by the store after work and the wonderful people there talked me off the ledge and only $55 and some shortened instructions later, the pool is back in business. Once that fire was put out, another quickly started because Mira had a 102 degree fever and Cora was crying complaining about her ear and chin hurting. Ina spent the night at Granny's and Dan worked late and the Champs were at a concert, so I spent the evening rocking two babies and medicating them back to a comfortable position. Thursday both girls woke up in much, much better moods. I worked from home. I love these mornings because the time I would normally use to get ready and pack up stuff for work I can instead use to meander around outside, water the plants, and smell the pool water. This evening was the rare combination of no one in the house having any extra activities plus Dan getting home at a decent time from work, so we celebrated with all of us getting in the pool and eating a delicious dinner together. After dinner we quickly had bath time and bed time because Friday was Ina's first day of full day pre-kindergarten summer school! She is starting at the school where she will be for the next seven years if all goes according to plan (I realize how big of an if that is, I promise). I drove her in for her first day, but she will be riding the bus from Granny's house from now on. We were greeted by a very friendly principal and after directions from only a few different people, we finally found her classroom and new teacher. She immediately recognized a few kids from preschool and dance class and found her name and sat down to the task of coloring a picture. It all seemed so normal that both of us forgot to cry when I told her bye and made my way to the office for some paperwork. I have a good feeling about this school. Pad Thai - this will forever have my heart as one of my favorite meals of all time. Monterrey Chicken - so, so, so good. Have a good holiday weekend! If I don't post again it is because potty training a red-headed two year old can actually kill a person. I am going to start a new blogging rhythm. I loved finding 3 things to be thankful for everyday, but I want to post more than once a week. I also found myself "reporting" rather than being thankful, so I could squeeze certain things into a blog post. I am hoping to post every Monday(ish) and Friday(ish) and to continue to jot down three things to be thankful for in my planner, because that practice is fantastic. So, we left off last Wednesday after we planted all of our glorious plants. I worked from home on Thursday and had the luxury of getting only one kid (who doesn't require shoes and therefore cannot lose them) out of the house as the older two girls were living it up at Grandma Frankie's. Ina's parent teacher conference was cancelled, so I quickly changed from the dress I was wearing to my glow in the dark Star Wars shirt and lounge shorts and took Mira to the nursing home to visit my grandma. Want to feel popular? Take an adorable baby to a nursing home. I hope I didn't traumatize Mira by handing her off to a few of the residents, but holding her made them so, so happy. We had to hurry home for an abnormally late work meeting for me with some co-workers in Australia and then Danielle and I drank a glass of rose while the kids played outside and we finished up dinner (see below). Dan and the older girls arrived home around 9 PM unfed and unshowered, so we had an abnormally late night, but I loved hearing about all the adventures at Grandma Frankie's house. She is such a blessing to our family. I went into the office on Friday and had a relatively busy day while the girls stayed home with Danielle. I came home to find Mira and Cora both still napping, dinner practically ready, and Ina in her swimsuit. It was a wonderful spring/summer Friday night that consisted of swimming, grilled burgers, mayo heavy salads, wine, and card playing. The only thing that would have made it better...never mind...nothing would have made it better (even though I went set twice in cards). I woke up Saturday morning to rain and being oh so excited that Dan didn't have to work. After I finished work the rain subsided enough for us to go swimming and Danielle and I to do water aerobics. The kids all joined in and by the end of the 20 minutes my arms and legs were sore. The whole house cleaned up just in time to head to church for a couple in our small group's baptism. Ryann and Kevin are new to our group and church and we were so excited about and proud of their decision to follow Jesus. Dan serves on the baptism team (cleaning up the water, handing out towels, etc.) on Sunday mornings, so when he asked if he could help out with this one too, our pastor answered with, "You can get in the tub!" Dan told me this story later and confirmed that he completely broke down in tears at the opportunity to help baptize some of our friends. I don't know if anyone from our small group had a dry eye at the end of it. God is good. Sunday morning was nice and slow, as we had been to church the night before. This was good because we were up late on Saturday and then Ina woke up in the middle of the night in a coughing fit so bad she was sick. Poor baby - after some nebulized albuterol she seemed to get better. I roasted a huge pan of veggies for the week, read my bible for small group, and puttered around the house until it was time to leave for my niece Hallaway's birthday party. Jessie had planned slime making and painting for activities. I don't know if Ina and Cora could have been more excited, as activities are their love language. We had to leave the party early to get back home in time for small group, and having Cora put the paint brush down wasn't going so well, so when my brother-in-law offered to keep the older girls until the party was over, I barely even asked, "are you sure?" before grabbing Mira and running out the door. We had an awesome small group discussion (we are studying Luke right now) and I was sad to see everyone leave. Danielle and I finished up dinner and soon Jessie and Cody were back with the girls and their kids who joined the Champ boys and all played outside for the next hour while the adults chatted. I wish they could have stayed forever. Even though I objected, the weekend was determined to end. I hope you have a good week! I will (hopefully) see you on Friday morning with a recap of our week. The best carnitas with our favorite easy slaw and a boxed Mexican quinoa from Aldi jazzed up with roasted corn and a can each of tomatoes and black beans. Everyone (including all five kids) loved it. Rainbow Potato salad- I strongly recommend this for your next BBQ contribution. Or possibly broccoli salad. Better yet, bring both. Taco salad - nothing special, but I kind of forgot about how delicious and simple taco meat and all the fixings are on top of tortilla chips and lettuce. 1. Hummingbird! Danielle hung a feeder in our backyard and within days we had a beautiful visitor. I could get into this bird lady thing. 2. I visited Grandma June in the nursing home and she was so, so much better than the last time I had seen her. Yay for improvement. 3. I was able to help my sister. Even though I am older, I feel like I am always asking her for help. This might be because she was a mom first, or because she is a nurse practitioner with the ability to write prescriptions, or because she is an all-around rock star at life. But today, I was able to re-pay a teensy tiny bit of help. 1. I have to be thankful that Friday was a slow day at work because I pulled into the office parking lot and realized that I left my laptop at home. I spent the next hour driving back home and then to the office again, only to realize an hour later that I packed non-matching pump parts. I took this as a sign that anything I did the rest of the day was doomed to fail and went home. 2. The girls and I visited my grandma at the nursing home and everyone had a great time. We ate goldfish, played checkers, pounded on the piano, and made a general mess of the area. All the residents loved seeing the girls which made me want to come back every single day. Ina even helped to push people back to their rooms after dinner. The most hilarious thing was that grandma's food is pretty similar to baby food. While she didn't care for it much, Mira absolutely loved her dinner. I told Grandma to continue to save her food for Mira. Ha! 3. Ina helping me "paint" pizza. It never gets old. Well, except when it gets messy. 1. A fast (for me) 5K with Danielle before the rest of the house woke up. This is my favorite way to start a weekend. 2. Dan's dad's camper company had their new building grand opening. It was great to see some of our friends and family. We enjoyed some really good food - particularly the cast iron peach cobbler. The girls succeeded in their goal to push every button, open every cabinet, and go inside every bathroom of the 25+ campers he had on site. I hope I succeeded in my goal of wiping all the Cheeto dust off their hands before they did so. 3. We opened the pool! The whole process was a team effort. Mr. Kyle ran the electricity. I scooped the water off the cover with 5 gallon bucket and a ladder. Dan fit the pipes. Danielle made margaritas and made sure Mira wasn't crying. The water was beyond cold, but seeing the kids jump in the water over and over again was all worth it. At one point Gunner screamed, "I feel so ALIVE!" right before cannon balling off the ladder. 1. The most beautiful Mother's Day service at church. They sang the song Slow Down and had a picture slide show of a lot of the babies at church. Ina and Cora were on there a few times and you better believe I cried. So sweet. 2. A delicious Mother's Day brunch with my sister, sister-in-law, aunt, mom, and grandma. At first going without the kids seemed odd, but then when I started thinking about it more, I thought it was the perfect way to celebrate with my mom and also celebrate myself without trying to keep kids quiet and in place in a restaurant or cleaning my house. Win-win! 3. Dan was able to get the stuff together to build his mom a tiered strawberry planter. He is so handy sometimes. 1. I remembered I didn't pack my phone in one of the five bags I packed before I left city limits. Technically, that isn't forgetting, right? 2. Dan was home early enough for me to take Ina to dance solo. They handed out the recital costumes (so cute) and I recorded their routine so Ina could practice at home. Now for something I never thought I would say: I need to buy some red lipstick. 3. The girls and I told stories before bed instead of reading. Their imaginations crack me up. I had to cut both of them off after five minutes because we would have never gone to sleep, but I really wanted to hear what happened to Cora's "giant puppy and the monster." 1. Costco sells pool supplies at a fraction of the price of Amazon. They work just as well, right? Right. 2. Wine night with a few friends that included TJ's fig and olive crackers. I need more of those in my life ASAP. 3. Dan made it home safely after driving to St. Louis and back in one day and working in between. Whew, it made me so tired just thinking about it. 1. All of my in-the-office meetings were cancelled, so I had an extra work from home (read: no makeup and messy bun) day. 2.Grandma Frankie picked up the older girls for a sleepover. I called to check on them and wasn't surprised to find they had already painted their faces and eaten ice cream cones. 3. Danielle and I planted flowers, tomatoes, jalapenos, kale, cucumbers, and herbs. We had so much fun going to the store to buy the plants and seeds and then digging in the dirt. I didn't know if we would be able to have any kind of garden this year, and although it is pretty darn small, I think we will really love and use the veggies we do harvest. Greek chicken bowls using this recipe but swapping the tortillas for quinoa. The rest of the days on my planner either say "pizza" (once made at home and once ordered in) or "leftovers" which is evidence that the busy summer time is here! I hope you have a lovely end to your week! The graduation started off with the kids marching in to Pomp and Circumstance. I swear that song triggers my tear ducts. Once all the kids were placed on the risers, they sang some of the cutest songs. My favorite was the ABC song. Ina, being the performer that she is, got into the hand motions so much that she knocked her cap off her head. Her little lip started to quiver out of embarrassment, but as soon as she saw the thumbs up from me, she kept right on singing and dancing. From then on, the cap was just a bother to Ina, so at one point she walked off the risers to hand it to her teachers. Which prompted another kid to do the same...and then another...and before we knew it there was a mass exodus of tiny graduates. The teachers were quick to get them back in place, but the whole thing was hilarious to watch. After the songs they called the kids up to individually accept their certificate from their teachers. Ina's name was accidentally called twice, to which her teacher replied, "We haven't cloned her yet!" The night was a great wrap up to a perfect year. I look back at her picture on the first day of school and she has grown so, both physically and mentally. She left the little world we have created for her. She experienced a boy "liking" her. She experienced a girl not liking her. She seemed to love everyone in her class, but I could tell there were a few she played with more than others. I honestly couldn't get her to tell me anyone's name for the first few weeks, other than the teachers, who she adores with her entire heart. Miss Isabel, Miss Lori, and Miss Joan are beyond amazing. Her preschool is operated by the school district, and therefore free to anyone in our town. As the price was low, I didn't really know what to expect. However, her teachers and the school have blown away any expectations I would have had. I cannot say enough great things about our experience and we hope to send Cora there ASAP. I was a little worried about Ina being too domineering with her peers (like she is with her sister), but her teachers assured me during parent teacher conferences that she likes to help and play mother hen. - She helped to initiate a school experiment to determine the school's favorite color. After weeks of work surveying each class and tallying the results, she reported that it was BLUE! The school celebrated by having everyone wear blue to school. You better believe I was 15 minutes late to work because painting Ina's nails blue took top priority. - Her class created a fund raiser to purchase well parts for children in Kenya who don't have access to water, after having to carry water 1/4 mile themselves from a local lake. They raised $1,500! - She discovered Highlights Hidden Pictures, which bring her more joy than anything else. Kindergarten is soon, and I know the teachers and school will have some pretty big shoes to fill in Ina's mind. We are so looking forward to the next chapter! 1. I made the time to paint Ina's nails blue for blue day at school. Cora also couldn't be left out, and she adorably spent the rest of the day walking around admiring her blue nails. Even by her evening bath she was still holding her hands just below the bubbles and watching the blue nails come up. 2. Old Navy and their 40% off sales. Ina needed new shoes and I "needed" new "running" shorts. 3. Both the Champs' and our evening events were cancelled, which made for a nice evening of slowly preparing dinner, playing, chatting and dancing to music. One of the really nice things about them living with us is how little we turn on the TV. 1. I passed the GCP test at work! Every two years we are required to take this test. In years past, the test was timed and relatively challenging. However this year wasn't timed and open book. I'll take it! 2. Ina's school had their end of year carnival. The weather was perfect. Dan had to work late, so I dropped Mira off with Granny. Ina and Cora closed the place down. We pet animals (snakes! turtles! a camel! ), played with lots of bubbles, ate hot dogs and ice cream, made our own slime, bounced in the bounce house, waited in line for the clown to make us balloons, painted our faces, and rounded it off with stopping by the book fair. It is so fun to have fun with your kids. I loved seeing Ina greet the kids in her class with a huge hug. She really does love them to pieces. One of the other moms sent me this picture of Ina saying hi to her son. 1. My mom came over to sit with the girls and watch The Greatest Showman while I mowed our yard. I love mowing - instant gratification. 2. We celebrated Cino de Mayo with Mexican food and eating dinner outside. 3. My favorite part was playing cards with Danielle and our moms while the kids played outside. Seriously, such a great night. 1. The healing power of God. He is still in the miracle business! 2. We went to the Nyberg's house for a pizza + salad lunch. We sat and talked on the covered patio while the kids played their hearts out. Water, and then subsequently mud, were involved. Ina's 2017 Easter dress will never be the same. 3. Dan turned on the outdoor shower. I feel like that is an unofficial sign that summer is here. 1. Dan had a good day at work and came home excited about some new opportunities. He also had enough energy to clear a junk pile in the back yard. Woohoo! 2. Popsicles - scratch number 3 above. Popsicles are the unofficial start of summer. 3. I started reading A Wrinkle in Time. How have I gone my entire life without this story? I am just a few chapters in and I adore it. I can't wait to watch the movie with the girls when I have finished. 1. My lilac bush is blooming! If you want to find me over the next few weeks, just look near my kitchen window. I cannot get enough of that smell. 2. Walking into Granny's with a greeting from Cora. She immediately drops what she is doing and screams, "Moooommmm! You're back!!!" and bounces around with excitement and a huge grin on her face. Then she hugs me and continues to pat me on the back for the next few minutes. She knows how to make a Momma feel special. 3. Our new mattress came in the mail. We have been in the market for a new mattress for a while now, and a friend of a friend recommended the Zinus memory foam. The price could not be beat, so we ordered it with one click. God bless Amazon. Dan hauled it up the stairs and sat it right on top of our box springs and other mattress. I slept princess and the pea-style, but very soundly. 1. MommaStrong. I have had to take a hiatus from the gym due to Dan's early (and late) work schedule. Courtney's workouts are 15 minutes and only $2/month. She is also so real in the best possible way. 2. New coffee machines in the office. It is the little things. 3. Corn on the cob - the official start of summer. Sorry, I can't stop. 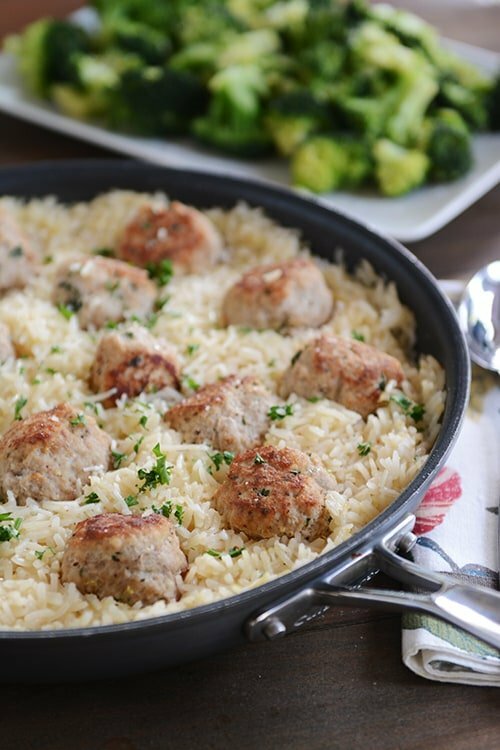 Skillet turkey meatballs with lemon rice, roasted broccoli, and green beans. I loved this meal, although it gives the illusion of being easier to make than it actually is, as the forming and then frying of meatballs is involved. However, the work was well worth it. Dan even said it was the best rice I have ever made. 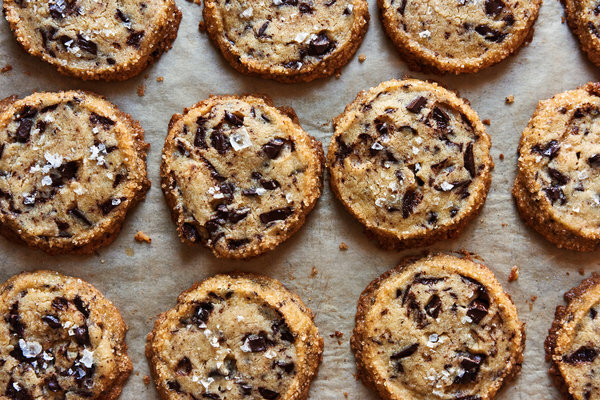 Shortbread chocolate chunk cookies: Just wow. I took these to Sunday lunch at the Nyberg's and they disappeared quickly. Very much worth the extra few steps. 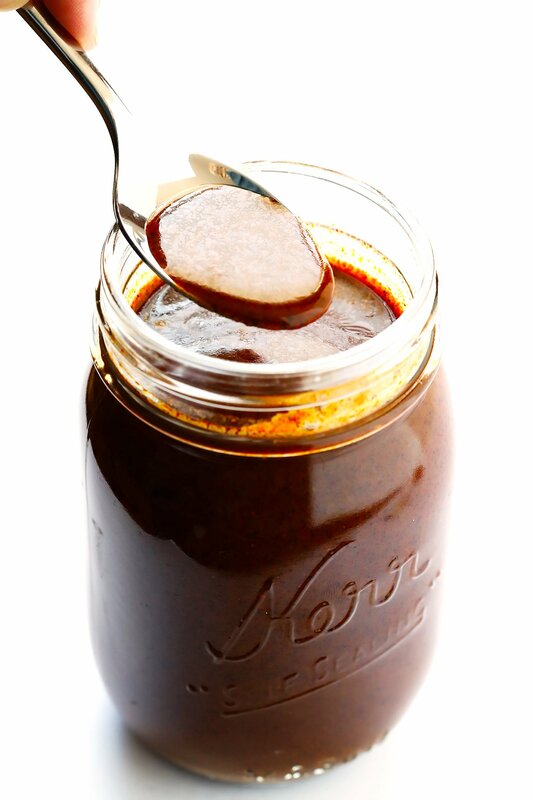 Enchiladas with our favorite sauce for Cinco de mayo! Oh and these margaritas - also so good. Italian sausage subs - I would not have thought this would taste good, but they were amazing. Basically, we seared the sausages in a pan with onions and some Italian seasoning and then put them in the slow cooker with pasta sauce on low for a few hours. Very similar recipe here. The texture and flavor were so good. A few days later I added the leftovers to pasta and roasted broccoli. I love when I find a good slow cooker recipe! 1. Mira caught the GI bug that Ina and Cora had the week before. It was so sad to watch such a small baby get sick. Nursing is usually my go-to for comfort and not an option as it all came back up within minutes. I was so thankful when she finally kept down a few ounces of milk by the time the morning came. 2. Granny watched the girls at her house, which is a little over a mile away from our house. After I closed my laptop for the day, I took the the jogging stroller for a run to pick them up. I love the look on people's faces when they see me pushing an empty double stroller down the road. Usually they are looks of confusion/concern, but yesterday a tween gave me a downright scowl. Like, how dare I do such a thing? Maybe I should put some dolls in there next time? 3. Mr. Kyle fixed our ceiling fan that has been making noise every time you turn it on. I am telling you, communal living is where its at! 1. Danielle cleaned the toy room and made cookies and banana bread (oh, and cared for my three children) while I was at work. I am not allowing them to move out. 2. The trees in our backyard flowered the beautiful pink flowers that only last for a few days. Every time I look out the window sparks a bit of joy. 3. Planner stickers. How did I just discover these? My work computer needed an Office update, so while my computer was occupied for two hours I went down the Etsy rabbit hole that is planner stickers. There are so many possibilities out there, but settled on a few basic ones to start with. 1. Danielle and I went on a very hard but very rewarding run with Mira in the (flat tired) jogging stroller. Woof, my legs were screaming by the end, but as I was in the car for the remainder of the day, I am so happy she pushed me to shake my legs out. 2. My mom graduated with her EdD (doctorate of education)! Despite my strong insistence on Ina not making the 2.5 hour car ride there, sitting still in an hour long ceremony, and driving the 2.5 hours back, she begged to go with me. Begged. So, I finally gave in, and honestly, she did great. She watched Marry Poppins on the way there and Moana on the way back and brought her gel pens to the ceremony. She had fun cheering on her G.
Mira also tagged along for nursing logistics and was great until the car ride home, during which horrible substances were exploding from her back side all over my van. Well, maybe just her car seat, but the smell definitely went all over my van. Poor girl. This GI bug is no joke. 3. Once we were back home, we picked up Dan and Cora (who hung out with Danielle in the morning while Dan worked) and headed to a new-to-us Japanese steakhouse where we met with the rest of my family to continue the graduation celebration. We ordered sushi and habachi and Ina attempted eating with chopsticks and Cora inhaled the food like she hadn't eaten in weeks. As if that wasn't enough, my grandma paid for everyone's dinner. As the kids were running around the parking lot afterwards, I kept on thinking about how I wish my family saw each other more. I guess I should do something about that, huh? 1. The most beautiful morning. I had the perfect amount of alone time to read the bible, listen to the birds chirp, and make myself breakfast and also had time to hang out with the girls and Dan in our room before we had to get everyone together for church. 2. Lunch outside! This requires significantly less clean up. Always a win. 3. After four weeks of empty check boxes in my planner, we finally cut the tall grass in the front of the house. 1. Dandelions (in someone else's yard). 2. On the way home Ina told me she wanted to get me a cook book for Mother's Day because she knows I like to try new recipes. I don't know why, but that simple observance made me feel so special. However, when I realized it was time to go and we were going to be late, I quickly picked Cora up off the toy she was on and she was not happy about it. Lots of screaming, kicking, and even hitting was involved. I didn't stop to check to see if all 30 other park-goers noticed, but I am sure they did. I seriously felt like I was dragging a wild animal out. The next few minutes were rough, but shortly later my smiling, laughing, dancing red head returned. Whew, I forgot how volatile a 2.5 year old's personality can be. 1. This HIIT workout was a quick and efficient way to get my workout in. 2. The warm weather makes swim lessons so, so much easier because zero changing is required. Heck, even shoes aren't required. When I am solo parenting three kiddos, wet swimsuits in the car seem like a minor detail. Also! Ina advanced to the next class in swim lessons. She is now perfecting her freestyle and starting her backstroke. Cora still comes up gasping for air with wide eyes after five seconds under water, but swim lessons remain her favorite 30 minutes of the week. 3.Leftovers for dinner plus The Greatest Showman. That combo makes for a pretty good night. 1. Danielle saved the day when I pulled into work and realized that I forgot all of my pump stuff at home. Ugh. I texted her out of frustration and she reminded me that she was going to the Costco right next to my office and could drop them off. She saved an hour of my life. 2. Ina graduated from preschool! I have a whole separate post planned for that, but it was a fun night for sure! We celebrated after with hot fudge brownie sundaes. 3. A tornado touched ground very, very close to our house. Thankfully, no one was injured and not much damage was done, but it is making me take those tornado sirens a little more seriously. We were just getting ready for bed when the sirens went off, so I grabbed a sleeping Mira from her crib and joined the rest of the crew in the basement. When we heard there was confirmed touch down in Belton, we moved all the kids to the shower in the middle of the basement. The older kids knew enough to be pretty scared and asked a whole lot of questions, but the little kids just thought it was a good time. Mira never even woke up. Spiced chicken (subbed chicken instead of shrimp) with naan, yogurt, and a cucumber/tomato/red onion salad (<-- our summer staple) with roasted asparagus. A light and refreshing, yet filling, meal. I recommend you try that spice mix on something ASAP. Monterrey Chicken with Aldi boxed quinoa and salad. This is our go-to recipe for company. Most things can be prepped ahead and it is just delicious. Chicken salad - I made this for lunches with some leftover rotisserie chicken, mayo, grapes, pecans, celery, etc. Fresh (versus dried) herbs would have taken it over the top, but I am looking for a go-to recipe. Do you have one? Philly Cheese Steak Casserole - all the requirements of a Sunday comfort meal.